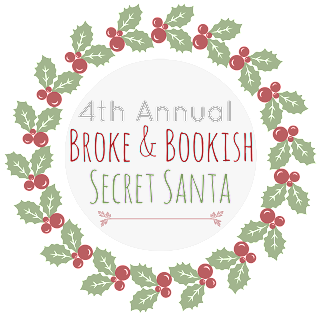 I signed up for The Broke and The Bookish Secret Santa way back when I hadn't even decided I was coming back to blogging. I knew I'd keep reading and staying in touch with the blogging community, so hey, I'm doing this thing. First, let me show you who was on the receiving end of my Secret Santa giving! Nina at The Sea of Pages! Not only was Nina super easy to shop for with a fantastic list of wonderful books, but her little extra things she loved were easy too! Throw in a dash of Christmas goodies and BAM. Done! But of course, Secret Santa doesn't end with buying the gift. Oh no. It is super duper fun to find out MORE about the person! So of course I stalked respectfully researched Nina's blog and discovered that she has a great variety of books in her TBR, is kind of awesome when it comes to her likes (EATING!) and is super cute to boot. Oh, and her design is GORGEOUS which I can admit without shame is one of the things I look for in new blogs to follow. I don't even care that it's shallow. It's true. 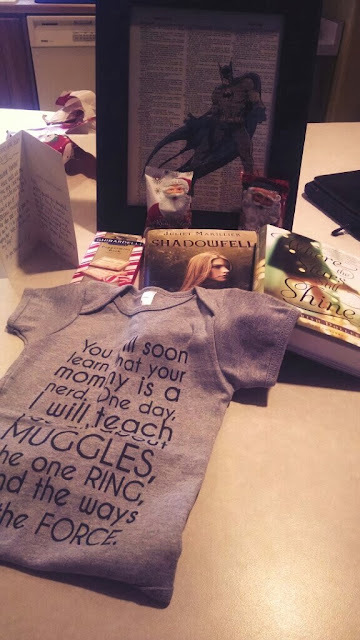 So not only did I get to give some awesome books and swag, but I found a new blogger to adore! AWWWWW. Now, let's move on to the happiest of happy dancing and pants peeing I have ever known. I was quite open with my impatience of receiving my Secret Santa gift. I knew it was coming because I trust the system but YOU GUYS when there are books coming who among us can be patient? If you say you're patient then you are a liar. Or a robot. Either way, no. So I'm sitting at my desk at work and my husband calls me to tell me a FedEx package has arrived. I said WHO IS IT FROM TELL ME THE RETURN ADDRESS WHERE IS IT FROM. He said some name and company I'd never heard of. He opens it upon my request and said there were wrapped packages inside. I stopped what I was doing and went home. Yes I did. Thankfully I have a job where I can do that now because I would have had to make a very difficult choice otherwise to get fired/pretend sick/deal with not having my Secret Santa package for 3 more hours. LOOK AT THIS YOU GUYS. BATMAN. BOOKS. ONESIE FOR LUCY. My heart can scarcely contain it! But the best part was that the card didn't say who it was from! I HAD TO GUESS. I died. And I giggled. And I tried not to pee. I used the clever little clues provided and deduced it was the amazing, wonderful, talented and queen of the car dance herself JAMIE! Now, lest you think this is a "Getting Stuff Is Super Cool" post, CHECK YOSELF. This is so much more. Because upon thanking Jamie 1000x for her amazing gift giving skills, I realized something even better. She was thoughtful about what she got for me. She took the time to drop little clues as to who she was. She was encouraging and uplifting in her card. She shared books she loves and knows I will love because she took the time to know me (okay, she already KNEW me but you get the point). She told me the struggles she had getting the package together because of different shipping addresses and special trips and fighting with the PO - ALL FOR ME - and I cried. Yeah, I know. Shut up. WHATEVER. Jamie embodied the greatness of Secret Santa in that she was caring and thoughtful above all else. I can honestly say I could not have been happier with a box of 100 books than I was with this package that was custom picked for me with love. And now I'm crying again. I can't help it! Just, MERRY CHRISTMAS OKAY?! *smooches* I LOOOOOOVED shopping for you. I want to be your SS every year because I have a zillion ideas! haha. Plus getting to love on one of your friends is the best. <33 Also fitting since last year you were my super helper sending SS emails out to people! BAHAHAH I was just waiting for you to get this package! Isn't that the most fun?! So sad I didn't remember to sign up in time this year wahhhh! THIS IS SO AWESOME! I loved the package that Jamie sent you, particularly the onesie (which I clearly did not see properly on Twitter). So glad you had a wonderful Secret Santa experience! 1. I love this Secret Santa wrap up post so much. 2. I love how excited you got with all the gift giving AND receiving! 3. I REALLY love how you found gifs from 9, 10 and 11 for this post. All of the point to whatever Hogwarts house you belong to.